Now that the autumn leaves have almost gone, and the snow has arrived somewhat early, I don’t feel quite so bad talking about the winter, which now feels very much upon us! You can learn a huge amount about the plants in your garden during winter because most have been stripped back to their bare bones. When the leaves have gone from most trees and shrubs you are really able to appreciate their true habit and shape. In addition the evergreen specimens, which have been holding the garden together throughout the summer months, really stand out amongst the crowd, highlighting areas in the garden that might benefit from a bit more all-round interest. These evergreen plants are even more important if you’re a tidy gardener as, once the perennials have been cut back and the leaves swept away, the structure of the garden is truly exposed. If you visit the gardens that you love to see in the Summer at other times of the year you’ll also be able to see how the hard landscaping elements work within the space. Often in summer, when the plants are spilling over pathways and terraces, it is not possible to see the bare bones of the design. In Winter the hard landscaping elements are more exposed and, as mentioned above, the structural planting becomes more obvious. Winter time also provides an opportunity to see how things are pruned and trained. Wisley is of course a brilliant place to go, there’s so much to see even when the herbaceous border is nothing but brown earth plus you have the added bonus of being able to ask some very knowledgeable staff if you have any specific questions. In particular, the fruit area really shows off their pruning and training techniques. 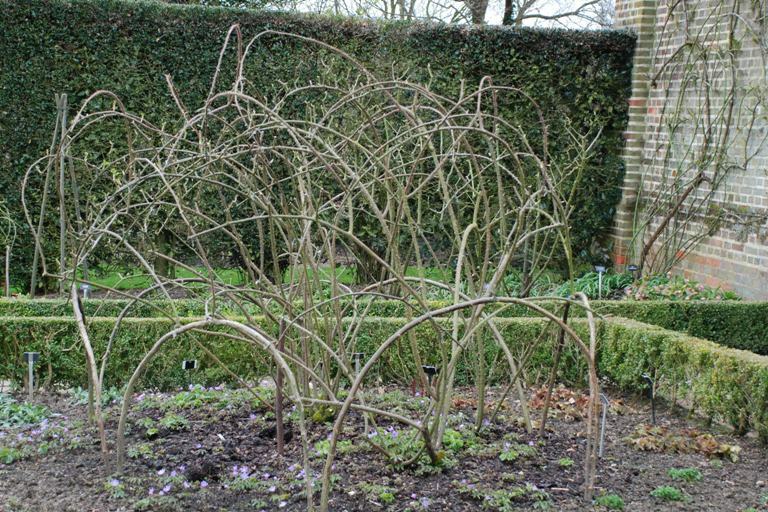 As you can see, the branches of this shrub rose have been arched and tied to form a structured framework from which the new shoots will emerge in late Spring. 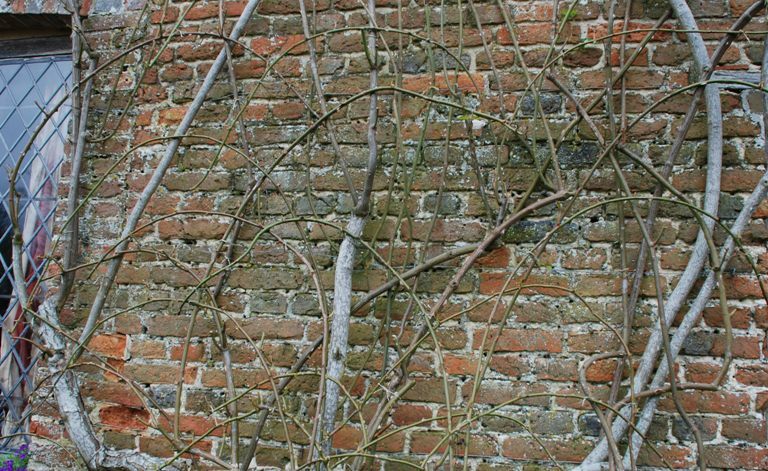 Similarly, the young stems of this climbing rose have been arched and tied to form a framework that, when in leaf, will provide a more uniformed cover of the wall throughout the summer months. Wherever you go, take your camera with you as this will really help to piece the jigsaw together when you get home and if you have pictures of the same gardens during the other seasons then you’ll really have something to work with!